STAR WARS AFICIONADO WEBSITE: 'SOLO': THE MEN BEHIND THE MAN! At Pinewood during the Mimban sequence being filmed. 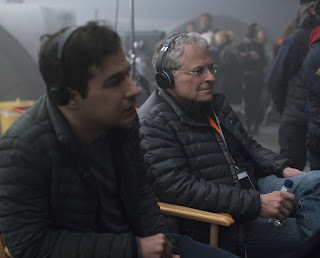 Any worries that their relationship might be disrupted working together on the script for a Star Wars film soon dissipated for father and son scriptwriting geniuses Lawrence Kasdan and Jon Kasdan in their near four years on and off concocting the action, fun, humour and drama for Han Solo's unique genesis in Solo: A Star Wars Story. Despite the problems of filming, overseeing a delicate balance of tone in action, drama and lightness of touch, and the change of directors, it was clearly a thrill for the duo, and for dedicated audiences, in seeing the final results come to life so well on screen.